One you're done kneading your dough, return the dough to the bowl and cover it with a damp dish towel to rise. In a modern home, you can just let the bread sit on the counter, but if you're a more serious homesteader who heats with wood and doesn't maintain an even temperature inside during the winter, you'll want to find a warm spot for your dough to rise. Many wood cook stoves have a warming oven just high enough above the fire to keep the dough warm without cooking it. In a pinch, you can turn your electric or gas oven to "warm" and put your bread inside --- depending on the model, you may also need to crack the door open to keep the dough from getting too hot. No matter how you do it, your bread should have risen to the point where it has achieved twice its original size ("doubled in bulk") after about an hour. Rising gives your yeast time to do its job. As I mentioned before, the dough rises because the yeast excretes carbon dioxide, which gets trapped by the gluten fibers and held in the dough. If you skip or shorten the rising steps, you'll end up with rock hard bread. 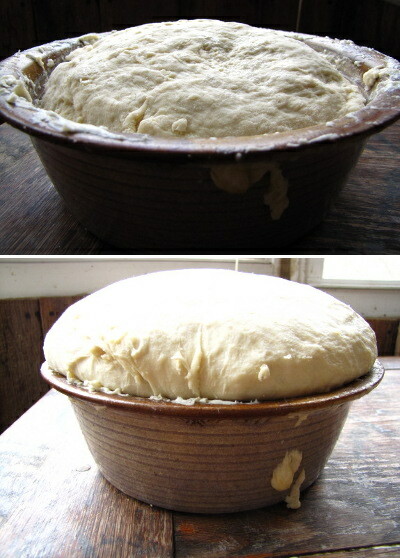 After it has risen, punch down your dough, shape it, and let it rise again. 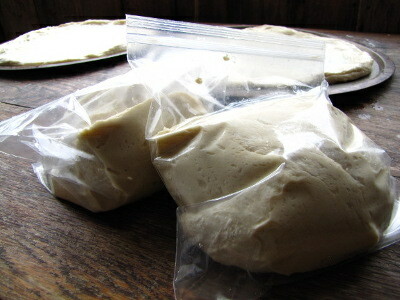 If you want to save some of the dough for later, put it in a plastic bag after the first rise and stick it in the freezer. Otherwise, shape the dough however you want --- into rolls, buns, or loaves. You can even form long strands of dough to make braided loaves, or can add cheese or herbs to make spiced buns. If you're a raw beginner, I recommend keeping it simple and making buns. It can be difficult to know when your bread is fully baked in a loaf pan, but dough in the shape of a hamburger bun cooks perfectly in very little time. Simple tear off a hunk of dough about half the size of your fist and flatten it, placing each bun on a greased cookie sheet. If you want to get fancy, you can sprinkle poppy or sesame seeds on top, then paint on an egg yolk to make the seeds stick and to give the bread a beautiful shine. Now it's time to let the dough rise until it doubles in bulk again. Pay more attention this time to ensure you don't ignore the dough too long and let it over-rise --- after a certain point, the gluten can't hold the carbon dioxide any longer and your buns will flatten out. But don't try to rush this rise either --- you want your dough to be as high as possible so you get fluffy bread. Preheat your oven to 350 degrees Fahrenheit, then bake your bread on the top rack until the top and bottom of each bun is very lightly brown, about fifteen minutes. Don't worry, the living yeast will be killed by heat, so all you're left with is a delightful texture and flavor. How many buns and/or loaves of bread will this make? 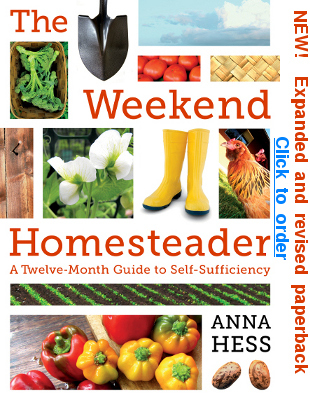 I made the recipe from the full Weekend Homesteader book (LOVE IT, by the way) and YUM! But it made 6 flattish buns (rising problem, apparently) and a dinky loaf. Should I have only done one or the other? Thanks! Sheena --- Good question! I can't imagine why I didn't put that information in the recipe. Unfortunately, we've gone off grains, so I haven't made this recipe in a few years, but I seem to recall that the recipe I included is a small one for experimental purposes and will just make one loaf or, I think, about six large hamburger-type buns. I hope that helps you work the kinks out of your system!